The Nevada Griffons lost the first game of this July 1986 double header. Helping Griffons come back and win the second game, though, was Mike Cavers, according to The Nevada Daily Mail. In that second game, The Daily Mail wrote, Cavers helped pitch the team to a 5-1 victory. "We played very, very well," Griffons manager Chris Smith told The Daily Mail. "It was a great pitched game by Mike Cavers." Mike Cavers pitched good enough that summer, and the next spring, to earn himself a pro career. Cavers, though, couldn't pitch well enough for a long career. Cavers' career lasted four seasons, making it to AA, but no higher. Cavers' pro career began in 1987, signed by the Orioles as an undrafted free agent out of Southwestern. With the Orioles, Cavers started at rookie Bluefield, getting into 12 games as a reliever, posting a 1.08 ERA. For 1988, Cavers moved up to single-A Erie, getting 18 outings, eight starts, with an ERA of 2.83. 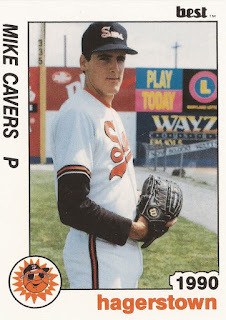 For 1989, Cavers turned full-time starter, going 11-12 between single-A Frederick and AA Hagerstown. In his 28 starts, Cavers' ERA was 3.01. That year in the Florida Instructional League, Cavers and a teammate became the targets of a practical joke played by teammates David Segui and Ben McDonald, Segui recalled years later to USA Today. Segui and McDonald took a 6-foot alligator out of a pond, putting it in Cavers and teammate Tony Chance's hotel room tub. Cavers ended up running screaming from the room, according to USA Today. Cavers came back, but he did so for just one more season. He played the year at Hagerstown, getting 32 outings, 12 starts. He also ended up going 2-10, with a 5.64 ERA, ending his career.